12/21/2018 – Thank you to all for auditioning. 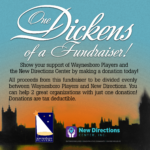 The Waynesboro Players do a few mainstage shows a year so be sure to check the Home Page for current information and announcements. Show information for Oliver! can be found here. Come out and Audition for Oliver! We postponed the second day (originally scheduled Dec 9, 2018) of Oliver! auditions for safety, because while we very much want to you come out to audition, we want you to be able to do so safely. There are roles for everyone, from ages 8 to 80! Most roles include singing and dancing, but there are even a few speaking roles for those who aren’t natural songbirds, so come on out, and let your friends know! Feel free to reach out by email or on Facebook if you have any questions! >>An orphaned workhouse boy. Innocent, clever, and kind-hearted. Charismatic and winning. Looking for an unchanged voice and the ability to hold a solid a British accent (which we can work on). >>To play “an undersized 16.” Cockney accent (which we can work on). Street smart, high energy, savvy, and good with people. Fagin’s best pickpocket and rascal. Needs to be dynamic, and dancing experience is a plus. >>Canny leader of a children’s gang of thieves. Runs a training academy for young pickpockets and burglars. Cockney accent. A devious con man who is very personable. He has spent decades mentoring criminals and can navigate London’s underbelly so easily because he is something of an institution. Motivated by an extremely strong sense of self-advancement and self-preservation. Needs a strong baritone voice, and an excellent sense of comic timing. >>Came up through Fagin’s gang and is now Bill Sykes’ doxy. She makes her living on the street and is devoted to Sykes in spite of their abusive relationship. Is charmed by Oliver and somewhat takes him under her wing. Cockney accent. Has an almost vengeful passion for life, because she knows how short life on the street can be. Must have a strong belt to a D.
>>Ruthless cutthroat criminal. Came up through Fagin’s gang, but now the student has surpassed the master, and Sykes is one of the undisputed alpha predators of London at large. A vicious, cold, abusive man whose first and only real priority is himself. Cockney accent. >>Head of the workhouse where Oliver has grown up. A pompous, corrupt, and faintly ridiculous figure. British accent. >>Runs the workhouse where Oliver has grown up. A rather fussy, canny widow, with a somewhat biting temperament. British accent. >>The fairly oblivious, but not terribly unkindly undertaker. He takes Oliver from Mr. Bumble to work in the funeral home as a coffin follower. He is a bit of a lush, and not very practical. British or Cockney accent. Possibly doubled with Dr. Grimwig. >>The undertaker’s wife. Exacting, practical, and the brains behind the business. British or Cockney accent. Possibly doubled with Mrs. Bedwin or Old Sally. >>Nancy’s protege, who is fairly newly “graduated” from Fagin’s gang. Makes her living on the street. High spirited, energetic, and idolizes Nancy. Cockney accent. >>Fairly posh British accent. Oliver’s grandfather, kindly, and the rare Dickensian example of a good person. An upper-middle-class gentleman of wealth and good-breeding, who cares about his fellow people, and hasn’t been worn down to cynicism or self-interest. >>Mr. Brownlow’s housekeeper. A warm, matronly person with an instant affection for Oliver, who wishes happiness for both him and Mr. Brownlow. Mostly a spoken part, but with a short song. British accent. Possibly doubled with Mrs. Sowerberry or Old Sally. >>A doctor. An upper-class friend of Mr. Brownlow. British accent. Possibly doubled with Mr. Sowerberry. >>A flirtatious, self-involved young girl who flirts outrageously with Noah Claypole. Daughter of the Sowerberry, with no sympathy for Oliver. British or Cockney accent. >>The Sowerberrys’ pimply apprentice. Cockney accent. He bullies Oliver and flirts outrageously with Charlotte. He appears violent but is revealed to be a coward. >>An old homeless woman who was Oliver’s nurse at birth in the workhouse. She stole something and is consumed by the need to confess her guilt before she dies. Cockney accent. – Auditions will have dancing and singing elements, as well as reading for parts, and getting a basic idea for actors’ ability with accents. – The dancing portion will be a few bars of music with an opportunity to learn and practice the moves briefly before doing a run of it. – Reading lines will be fine with or without an accent, but we will ask everyone to at least attempt a British accent on a second pass of the lines, to get an idea of where we would be starting with accent work. Oliver — Where Is Love? Ensemble Role – If someone would like to audition for an ensemble role, they’re welcome to audition with any of the songs above in their range, or the song Who Will Buy. Do look at your potential conflicts between December 2018 and March 24, 2018. DO list your conflicts on your Players audition information form when you arrive. This helps the director set the rehearsal schedule.